Hip Hip Hooray! Such good news!! But wait… the Department for Business Innovation and Skills (BIS) have not yet confirmed the news that Vince Cable has shelved the plans to privatise the Land Registry. They are not saying anything until the official report on the New Service Delivery Company consultation is published. “As you are aware, we have carried out a public consultation on the introduction of a Land Registry service delivery company, which looked at a range of options – including the status quo. We will publish the Government response shortly. The usual stock answer – lacking in imagination! But there won’t be smoke without fire. Vince Cable may well be wanting to scrap the plans, but if the ‘Wider Powers’ gets passed through Parliament, the threat of privatisation will always be there. If everything goes according to Government plans, the Bill will be passed and the Land Registry will become the sole provider of Local Land Charges searches and official search results. These are the building blocks that will pave the way to privatisation at a later date. In anticipation of the Bill being successful the Government can afford, at this stage, to say they are scrapping the idea. So whilst we can celebrate the effect that #peoplepower is having on the plans, we know that the campaign is not over yet! 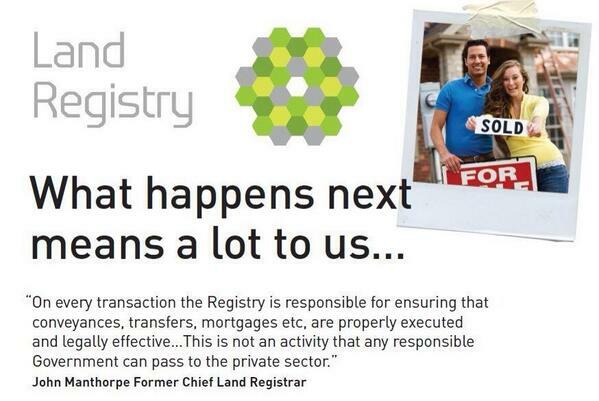 Please sign and share the Petition and help keep the Land Registry public! We were concerned that the Government’s consultations to the Land Registry would turn up in the Queens Speech. It seemed to us that the very short consultation period was deliberately timed to coincide with the Queens Speech. No surprises then when it did! Not easy to find contained within the Infrastructure Bill! The Bill would transfer statutory responsibility for the Local Land Charges register and delivery of Local Land Charges searches to the Land Registry supporting the delivery of digital services and extend Land Registry’s powers to enable it to provide information and register services relating to land and other property. The Local Land Charges in their response to the consultation, state their concern, which is shared by many, that Land Registry has failed to demonstrate its understanding of the service provided and the vital part this plays in the housing market and wider economy. The Governance guidance on consultations state that a response is to be published 12 weeks after the date of closure. The response to the consultation was finally published on the 16th June. Only 15 days late! I wonder what took them so long? Save the Land Registry! Not because it is failing – it has 95% customer satisfaction, paid £98m to treasury last year and reduced fees to customers. We can’t talk highly enough of their services. So why does it need saving? It needs saving from being sold! At the beginning of the year, the Department for Business Innovation and Skills (BIS) were asking for views on granting the Land Registry ‘Wider Powers’. This would enable the Land Registry to provide the Local Land Charges searches as other property related searches instead of the Local Authorities and compete with the Independent search companies. the first part related to its proposal to extend Land Registry‘s powers to enable it to provide services relating not only to land registration but also to land and other property. The second part related to Land Registry‘s proposals to amend the Local Land Charges Act 1975 to enable Land Registry to provide a more consistent, standardised Local Land Charges searches system. The purpose of this consultation was to give all persons with an interest in the property sector the opportunity to consider and comment on the proposals. 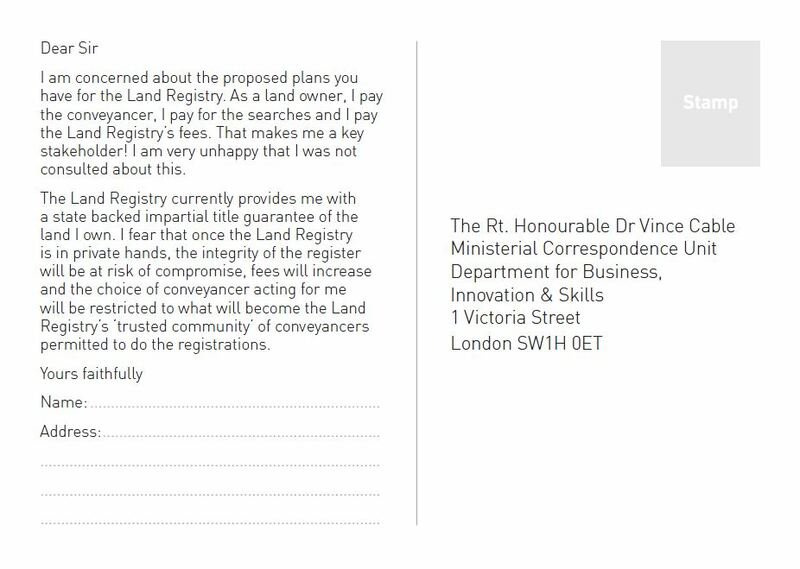 A week later the Land Registry asked for stakeholder’s views on proposals to create a new service delivery company to take over responsibility for processing land and property registration from HM Land Registry. The proposal is to retain a separate Office of the Chief Land Registrar within government, which will mainly perform regulatory and fee-setting functions, to make sure customers’ interests continue to be protected. The eight week consultation ran from 23rd January 2014 – 20th March 2014. The Land Registry’s Chief Registrar Ed Lester, and Executive Board and BIS asked for the views of stakeholders promising that no decisions would be made on either consultation until all the responses to the consultation were published. The Local Land Charges and the Independent Search Agencies (IPSA & CoPSA) because they provide the searches required when purchasing a new property or taking out a mortage. But don’t be surprised if you knew nothing about it! Hardly any of the stakeholders knew about it. The consultations were not well publicised at all and it was confusing to understand what the ramifications of the proposed changes would be. We have prepared some postcards for members of the public to sign and send to Vince Cable. Please contact us allsorts@apbassett.co.uk if you would like us to send you some. We arranged for some of the stakeholders to come together to explain the situation and to share their concerns. Each stakeholder has a different reason for opposing the plans, but the one thing we all agree on is that the Land Registry must remain in the public sector. That is why we are campaigning. Many other High Street law firms up and down the country feel the same and are also standing up and campaigning on behalf of their clients. If you feel the same way, pleased join us in telling the Government NO to the privatisation of the Land Registry by signing the 38 Degrees Petition. All the latest updates are on the Facebook Page. Please read the letter to Vince Cable in response to recent decisions taken by the banks that affect you the consumer and many other small law firms like ourselves and the communities that we serve. An article by Paul Bassett that looks back to what the High Street used to be like and how our shopping and business opportunities have been shaped. Is it irreversible?